« Is London really cursed by having lots of rich people? 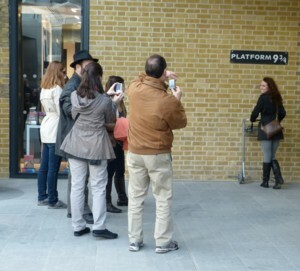 As you can see from my picture, I wasn’t the only photographer snapping away, and trust me, she and I were two of many. So maybe this really was the first public day of this new piece of London show-off modernity? The www confirmed it. I knew roughly what this concourse was going to look like, having seen plenty of images of what the architects hoped it would look like, and, more recently, some photos taken by officially selected snappers before the rest of us were allowed in. But until you actually see things like this in the flesh, so to speak, you never really know what you think of them. I was most agreeably surprised. Kings Cross, having been for the last decade put severely in the shade by the magnificently reborn St Pancras Railway Station, literally only a few dozen yards away, wasevidently making a huge effort to respond to that new Eurostar Palace. But I had feared something like one of those seemed-cool-but-actually-rather-naff, seventies, “designed” (as in: over-designed) pieces of lighting equipment. Not quite lava lamp, but in that kind of territory. I feared that the place would simply not be big enough to justify all that virtuoso metal patterning. I have a vague recollection of the real entrance to Platform 9¾ being in one of the old brick arches between Platforms 9 and 10, and an even vaguer recollection of waiting on Platform 10 for a train, and seeing some Pottermaniacs cavorting in front of this entrance. If that’s right, the sign I photoed yesterday is a fake. A fake, I tell you. I guess they figure that the platform ticket business they might be doing is not worth all the bother. A fake? Maybe us muggles simply can’t see it, or go through it! In at least one of the Harry Potter movies the characters prepare to go to King’s Cross and then we see an exterior shot of St Pancras. The locations scouts presumably went to King’s Cross, saw St Pancras next to it, thought that it looked more spectacular and shot it, on the basis that most of the audience wouldn’t know the difference. Of course it is fake: the bricks are not red. Then return for a visit. I promise to find Keats house this time. Always have a guide – ever for a city one thinks, one knows. 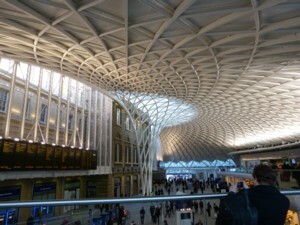 As for the new King’s Cross – it looks O.K. After all St Pancs is just the other side of the road. One thing that Brian managed to teach me about architecture – haveing buildings of different styles in the same street is not a crime. Indeed, Paul – it’s called ‘eclectic style’, they do it with furniture too. It has to be done carefully, though: too much of a mishmash, and suddenly it doesn’t look so good. Also, things need to be sufficiently different. I will return, question is when. If I may paraphrase Maximillion Galactica, what a fabulous waste of taxpayer’s money, on gay trinkets and baubles. Fabulous! That concourse has been a long-standing problem. For a long time there was a collection of one-storey buildings in front of King’s Cross colloquially known as the “African village”. And then came that 1960s monstrosity. This is the first time the front of King’s Cross has ever looked good. 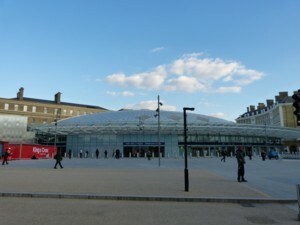 See here http://www.lner.info/co/GNR/kingscross.shtml for what I mean. As I recall, JK was thinking of Waterloo when, sat up in Edinburgh, she described platform 9 3/4 for the first time so you can’t actually find where the entrance isn’t. This may or may not be magic. Why are there two huge train stations (Kings Cross and St Pancras*) directly across the street from each other? Do they serve different rail lines or something? “you can’t actually find where the entrance isn’t.” Wonderful line. * Every time I see that I read “St Pancreas and wonder why they named a saint after an internal organ. If memory serves, King’s Cross was built to serve the Great Northern line to Newcastle while St Pancras was built to serve the Midland Line to Manchester via Derby. Every time I see that I read “St Pancreas and wonder why they named a saint after an internal organ.